Vitiligo is not a serious or fatal disease, but it is a social stigma that a vitiligo affected person suffers in his day-to-day life. The affected individual becomes a social taboo. Besides this, not just the vitiligo affected person suffers from embarrassment but also his family suffers contempt. Sometimes, the patients may develop low self-esteem and suffer from depression due to this condition or may hate themselves for the same. At such times, the family of the vitiligo affected person needs to support him. Since this disorder does not spread through touch, you need not ignore or avoid the beautiful soul just because the person suffers from vitiligo. So are you curious to learn what vitiligo is and everything about it? Read on to discover all about it. In the layman’s language, vitiligo is a loss of the color of the skin due to defective melanin production. This melanin pigment is produced by the cells called as melanocytes. When these melanocytes reduce in number or fail to produce enough melanin for the skin, you tend to suffer from lighter skin color than normal. Vitiligo is an acquired disorder which is progressive in nature. It is basically a pigmentation disorder. There can be no prediction as to how much skin color loss or de-pigmentation a person can undergo. However, melanocytes may still harbor below the de-pigmented skin or hypo-pigmented skin. Some of the commonly affected areas are face, neck. eyes, armpits, groins, and sites of injury. The body hair that grows over the affected skin parts may also, sometimes, turn gray. This explains the deeper pathology of the disorder. It is very important to understand that vitiligo is non-infectious and does not spread through contact. Indian population has one of the highest incidences of Vitiligo, about 8%, while other countries Mexico and UK as well have significant occurrences of vitiligo. The USA is estimated to have about 1-2% of the total population incidence. 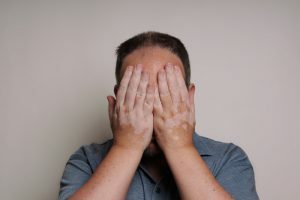 The patient of vitiligo is diagnosed by the clinical appearance of his de-pigmented skin and the glowing appearance of the spots or affected areas below the UV lights in clinical examination. Histologically, you can differentiate vitiligo from other hypo-pigmented disorders through biopsy. Treating vitiligo can be very difficult, at times, but never lose hope. Homeopathy is a reliable option patient can count on to get treated effectively. And, of course, homeopathy can award wonderful results to vitiligo patients, however, this largely depends on the type of the vitiligo. A lot of factors play a major role while treating vitiligo. Thus, if you are suffering from symptoms of vitiligo, please do not hide or feel embarrassed. Get yourself treated with homeopathy and walk with confidence.